In our opinion, DJIhas long been the king of consumer drones.But while its Phantom series machines have always been impressive, they've also been more than a little on the expensive side, being around the £800-£1,000 mark. The newest addition to the range is the Standard, which sits below the Advanced model and costs a mere £649. Is the Standard able to match the innovation we've come to expect from DJI but at an affordable price? We've gone hands on with a production prototype to find out. • More of the best drones you can fly can be found HERE. Let's start with the most important point shall we? What is it like to fly? DJI's success is built on out-of-the-box usability, and the Standard is no different. Simply screw the propellers on, charge the batteries and away you go. The Phantom 3 Standard can be launched using the controller, or automatically from the app. If you press the 'Take Off' button in the DJI GO app the drone springs into life and hovers around a metre above the ground. It will stay here until you tell it what to do next. Push the throttle stick all the way forward and the aircraft will shoot up in the air at 5 metres per second. That's impressively fast. The Standard will continue to ascend to around 6,000 metres above sea level, at which point a message will appear on your screen telling you to stop. Landing is just as simple, capable of descending at 3m/s - or a lot faster if you completely cut the engines, a feature that's included for emergencies. Simply pull down on the throttle and it'll head back to earth, or select 'land' on an app and it'll do everything automatically. If you happen to lose connection to the drone mid-flight, it will initiate 'Return Home Mode'. This, as the name suggests will bring the drone back to where it took off. DJI has installed a block that stops you from taking off in restricted areas (around airports for example), obviously this can be bypassed, but it's an intelligent feature that stops people being idiots. The DJI is fairly heavy at 1.216 kg, but this makes it incredibly stable in flight. The biggest advantage to more expensive drones is the ability to hover. This means you don't need to constantly adjust the throttle stick for it to stay in the air. It's also impressively fast, capable of reaching 16 metres per second (with no wind) - that's 35 miles per hour! The aircraft is incredibly nimble as well, with the ability to stop and turn abruptly. The motors are positioned upright rather than slightly tilted like the Advanced and Professional models and this has a small negative impact on stability. However, I wasn't disappointed with the Standard, despite having used its earlier and pricier brethren. The Phantom 3 Standard is also capable of several intelligent flight features, including 'follow me', 'waypoint navigation' and 'points of interest'. I haven't had a chance to test these features yet, but will update when I do. Along with the new drone, Phantom have released a new app to control it -- DJI GO. The Standard is more reliant on the smartphone application than the Advanced and Pro models -- as it's the only way to control the camera. The setup process is simple -- download the app on your smartphone (Android and iOS compatible) and connect to the Wi-Fi network created by the controller. Once connected the app will automatically detect a drone is present and you'll be able to 'Enter Camera View'. If the drone has a problem for whatever reason, you'll be notified via the app. The live view from the camera is clear, with a 720p resolution, and lag is almost nonexistent. It's better than most action cameras, in fact. The application also gives you direct access to camera settings, with the ability to change ISO, white balance, shutter speed -- pretty much anything you'd be able to do on a DSLR camera -- but this one is 6000 metres in the air. The camera on this thing is very impressive. Its 1/2.3" sensor is capable of capturing 2.7K video (at 30fps) and 12-megapixel stills. It's also capable of 1080p at 48 fps and 720p at 60 fps. For the most serious videographer, the Advanced model is better with 1080p at 60 fps, but for most people the Standard camera will be perfect. Previous Phantom cameras featured a ultra-wide angle fisheye lens. This created impressive shots, but they were very distorted. The new Phantom Standard features a 20mm equivalent lens, but it gives an impressively distortion-free image. The camera can also be used in fully manual mode, allowing you complete control of how the images turn out. The controller is similar to the Phantom 2 controller, but smaller and more portable. It featurestwo control sticks (throttle and tilt), two switches in the top corners and a dial to control the camera gimbal. It connects to your smartphone via Wi-Fi, instead of the excellent Lightbridge technology used by the Advanced and Pro, but thankfully the big Wi-Fi booster is gone from the previous model - it's now internal. The battery is a 4480 mAH LiPo, and although it looks identical, it's different to the battery used in the Phantom 2s. However, it isthe same used by the other two Phantom 3 models - so if you're looking for another drone for multiple aerial shots, this will play nice in an ecosystem. DJI claim the battery life lasts 'up to' 25 minutes - we've found that to be accurate in calm conditions (windy weather cause the battery to depreciate faster). The Phantom 3 Standard may be the entry level model in the DJI range - but it's still incredibly capable. The battery life is impressive, it's a breeze to fly and it's unbelievablyquick. The camera is also very good, and capable of capturingstunningly detailed images. 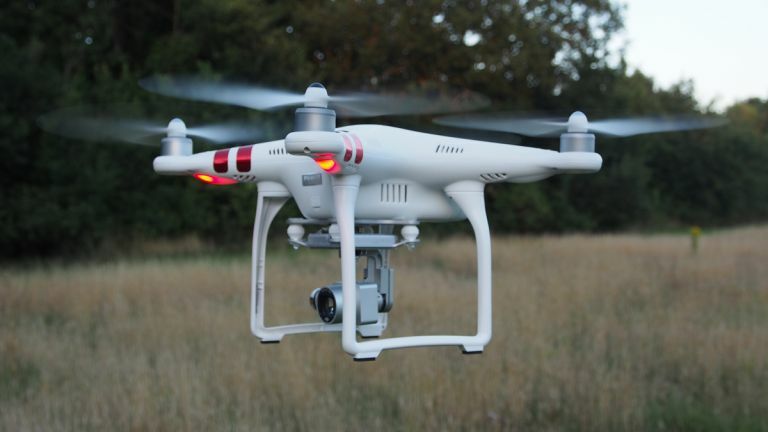 When it comes to cost, the DJI Phantom 3 Standard is £649. That's not exactly pocket money, but if you're after a near-pro-grade airborne camera, this represents excellent value in my opinion. It also brings it into the realms of something you could consider a big boy's toy. While the Advanced and Pro Models (which are better, obviously) are probably only of interest to would-be professional videographers and photographers. The Standard, however, is great fun to mess about with, but gives excellent results when you want to do some serious aeriel photography.